Sometimes I’m approached to recommend picture books that deal with a particular issue – toddler tantrums, a new baby, mealtime mischief. Sadly, as well as these common stepping stones in a child’s life, I’ve also been asked to compile lists of books that help a young child deal with anxiety, and in some cases: grief. Last week I was sent a book that deals with death but in such a positive way that I wouldn’t just suggest it as for those children who are experiencing a death in the family, but as a general book for all children to grasp the concept of death, and on the flipside of that, even the meaning of life – questions we all have at some point. 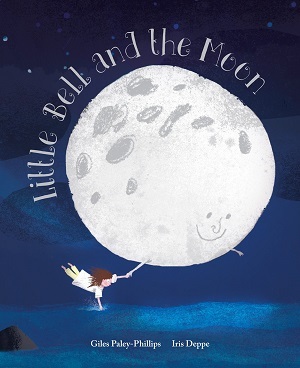 Little Bell and the Moon by Giles Paley-Phillips, illustrated by Iris Deppe, addresses concepts through narrative. Through the lifespan of a small girl called Little Bell, and her relationship with a personified Moon figure, the reader is privy to adventures through landscapes as the pair travel the world. Eventually, and sadly, Little Bell dies, and although the Moon is mournful, it watches as Little Bell’s spirit is carried into the air, and transformed into a light in the night sky. As Bell’s soul drifted from her room”. Reminiscent of the adventures of the snail in The Snail and the Whale by Julia Donaldson, illustrated by Axel Scheffler, the Moon takes Bell through “bays with dusty sand” and “far across the seas” although the illustrations bear testament to the fact that everything is seen in moonlight only – the colours are muted, the images seem almost ephemeral – which adds to the feeling that Bell’s life is fleeting. But the overall impression is that the world will continue after Bell has gone. The text doesn’t speak of everything that is contained within each illustration – the beauty is that it is left to the reader to explore with their eyes what is portrayed on the page – as if the author and illustrator are saying ‘look up, look around you’. The landscapes vary hugely – one is of the pyramids in Egypt complete with camels and palm trees, another of a Northern forest with the aurora borealis complete with deer, an owl and plant life. The most poignant spread is that of Little Bell in her bedroom just after she has died. The pictures on the walls tell of a life well lived – family portraits with happy faces, and exotic artworks on the wall, a globe on the dresser – this lady has travelled and loved. This is a text about our lives as well as our deaths. It’s not frightening, but manages to convey a tranquil calm through the darkened pages and the graceful text. It alters our perception of what a picture book should be. You can buy it here from Waterstones, or on the Amazon sidebar. 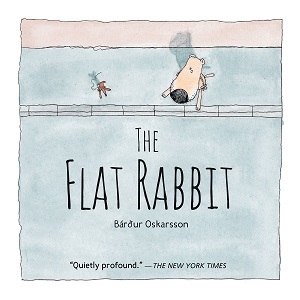 Like Little Bell and the Moon, The Flat Rabbit has a measured tone – a leisurely pace to the story. In the end they find a way to give the rabbit the perfect send-off. It’s a another glorious example of what can be done with the simplicity of picture books. You can buy it on the Amazon sidebar.